From 6 to 9 December 2017, the City of Hangzhou, China, hosted the UCLG World Council and Executive Bureau meetings at the invitation of Xu Liyi, Mayor of Hangzhou. 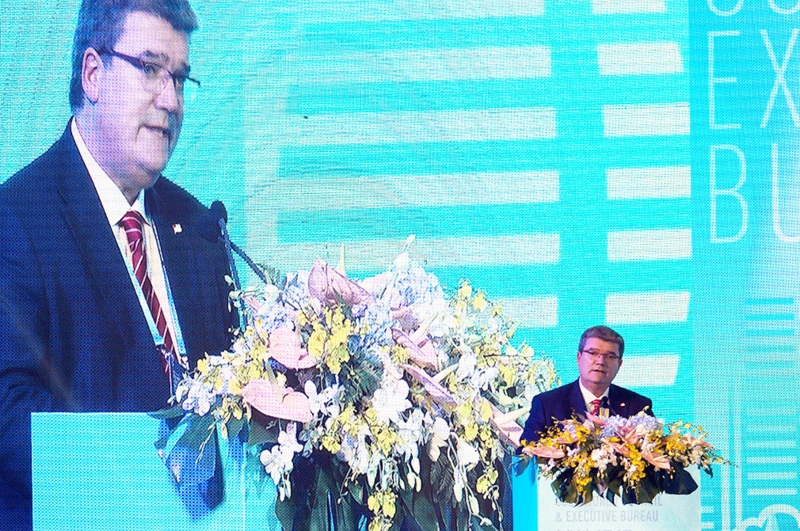 The meetings gathered more than 400 participants and were held back-to-back with the Forum on Smart City and Big Data organized by the City of Hangzhou and the Chinese People’s Association for Friendship with Foreign Countries (CPAFFC). The Official Opening of the World Council took place on 7 December 2017. 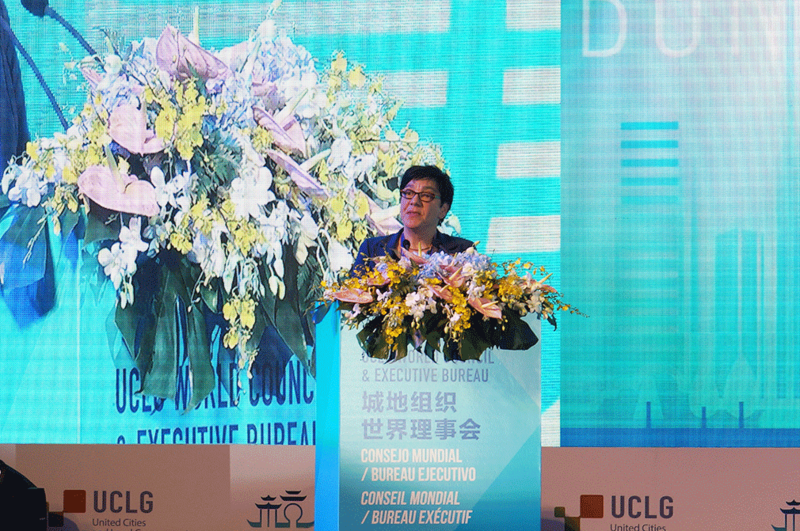 The Mayor of Hangzhou, XU Liyi, opened the World Council meetings together with the President of UCLG, Parks Tau and the Secretary General of CPAFFC, LI Xikui. 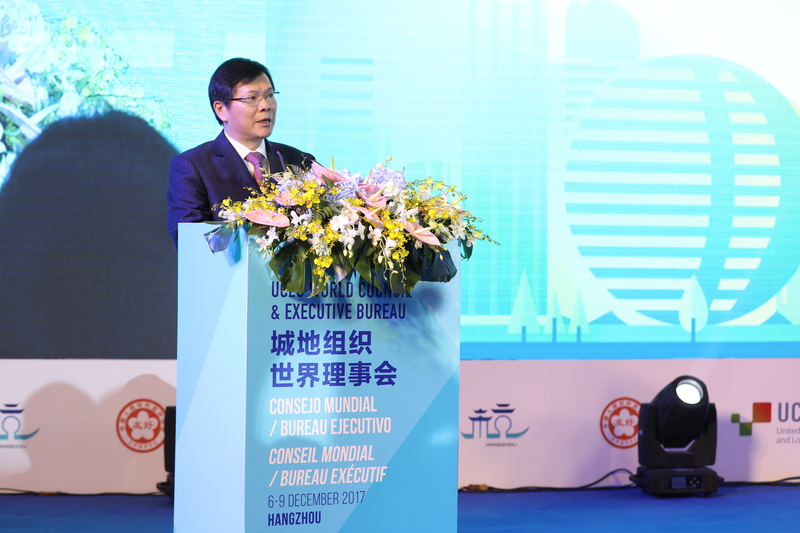 Mayor of Hangzhou, Xu Liyi, warmly welcomed all delegates to the 2017 UCLG World Council and the Forum on Smart City and Big Data, and expressed his interest in sharing practices towards the improvement of smart cities like Hangzhou. 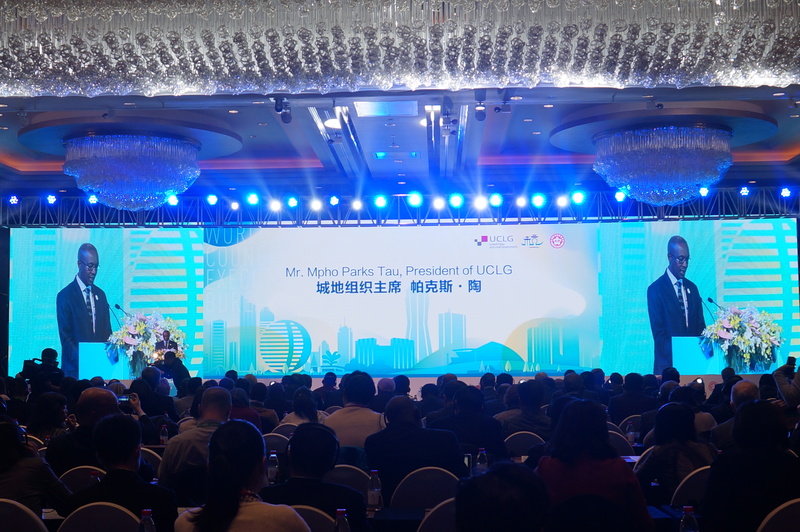 In his address, the President of UCLG, Parks Tau, thanked the Mayor of Hangzhou for his generous welcome and for taking the opportunity to put the topic of Smart City and Big Data up for discussion. Parks Tau also thanked the Chinese People’s Association for Friendship with Foreign Countries for their continued commitment to the organization, and for their support to these meetings, which has enhanced the relationship of UCLG not only with the Chinese membership but also with UCLG ASPAC. “Your leadership and vision is what networks of UCLG are all about. UCLG is about local leaders putting our priorities on the global agenda and coming together to share perspectives and find solutions. 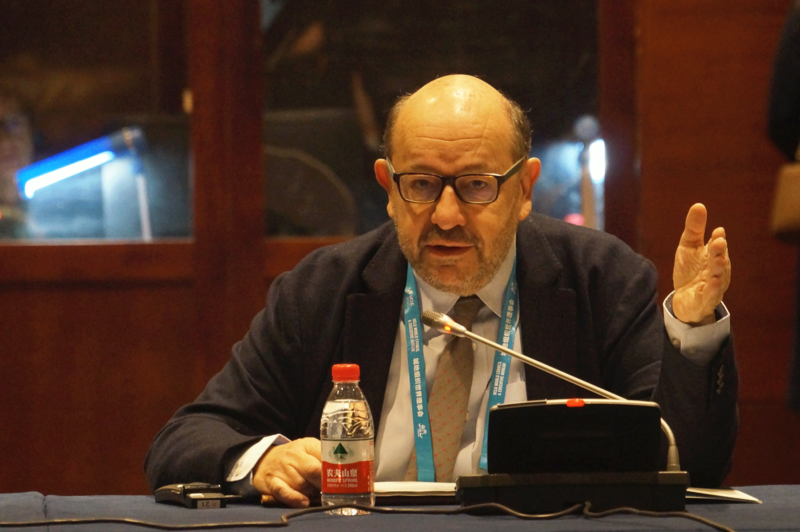 UCLG has made great strides in all five of our strategic work areas: implementation, advocacy, monitoring, learning, and strengthening the network”, he said. The President of UCLG said that "digital does not only refer to technology and infrastructure; it also refers to the human aspects and the interconnection of services to build a more sustainable and equitable future for all"
President Tau concluded by saying that “UCLG members are committed to sharing their experiences, not only digital, but also with relation to basic services and the management of information. UCLG exists to put forward the achievement of inclusive municipalities and cities and the use of ICT as tools for development, beyond digital development”. Amina Mohamed, Deputy Executive Director of the United Nations Environment Program, wished to send a message of support to this action by local leaders to advance the implementation of the SDGs in which she said: "We need more engagement to advance to have success with investment plans with the 17 SDGs sustainable development goals. Local leaders are working at local level in this implementation y i am grateful for the work by UCLG´s networs in this way". The Forum on Smart City and Big Data was held on the same day, just after the Opening Ceremony of the World Council. The Forum explored how modern cities use mega data and ICT enablers for Smart City development, and how to coordinate efforts among governments, universities and research institutes, and businesses for better innovation in cities. The Forum was centred around two round tables. “Big Data Facilitates Urban Governance”, the first session, invited panellists to discuss a case study on smart traffic. The second round table, entitled “Smart implementations and Green Sustainable development”, explored how digital life can facilitate green development. There is no economic development without social cohesion in our cities! A presentation of the 2017 Smart Cities Study by the Mayor of Bilbao, Juan Mari Arbuto, was also organized in the framework of the Forum. The "Smart Cities Study", developed by the UCLG Committee on Digital and Knowledge-based Cities, aims to provide information in a didactic way on the different strategies that cities around the world are putting in place, in order to move forward on the key aspects that make up a “smart city”. Juan Mari Arbuto expressed that “Information and communication technologies used to improve the lives of citizens is very important, but it is not enough. We must be more ambitious and aspire to reach social cohesion and economic development through the smart use of data. We cannot have economic development if we don't work on improving social cohesion in our cities. In order to achieve the goals we envision, it is important to include all stakeholders and align strategies”. UCLG Vice-President for North America and President of the Federation of Canadian Municipalities (FCM), Jenny Gerbasi, presented an overview of the efforts carried out by Canadian municipalities supported by FCM to create innovative solutions for local governments towards liveable communities and local economic development. How can our organization contribute to the localization of the SDGs? A session on localizing the SDGs also took place during the morning of the same day. The session provided updates on the SDG localization process and presented the four main pillars of UCLG action for localization: advocacy, monitoring and reporting, learning, and the UCLG Local4Action Hub: an innovative initiative that aims to turn the 2030 Agenda into local actions. Secretary General of UCLG, Josep Roig, opened the session, highlighting that “We will work on advocacy from the bottom-up and also the top-down, in order to raise awareness about the key role of local and regional governments in the achievement of the global agendas (bottom-up) and about funding opportunities and the global agendas at local level (top-down)”. 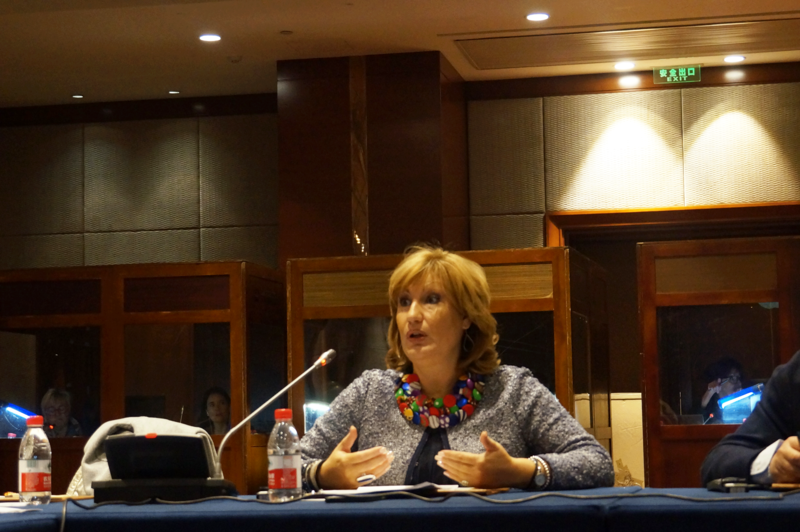 Deputy Secretary General of UCLG, Emilia Saiz, added “local action cannot be built on implementation alone; it must be built on strategizing together and taking decisions together”. The meetings will continue until Saturday 9 December. The UCLG Executive Bureau will hold its business session on Friday 8 December, following the inaugural sessions of the Policy Councils on the Right to the City and Multilevel Governance, and the UCLG World Council business session is expected to take place on Saturday 9 afternoon, closing the meetings, following the inaugural sessions of the Policy Councils on Opportunities for All and Resilient Cities.